OAKLAND, Calif. -- For a half, the defending champs looked like their old dazzling selves. That was enough to beat Dallas. The Warriors are looking for much more from themselves. Stephen Curry had 20 points, eight assists and seven rebounds, and Golden State bounced back from a tough stretch to top the Mavericks 121-103 on Thursday night. Curry's pretty three-point play with 1:28 left in the third put the Warriors up 88-83, and once Golden State got going in transition the Mavericks couldn't keep up in what became a dunk fest. The Warriors began the fourth on a 14-5 tear. "They strung together a couple of stops, got some easy fast-break points," Smith said. "They took the momentum and kept it from that point on." Despite another slow start, Golden State eventually found its groove and delivered all the big plays when it mattered. "We fought through that first half, that malaise, whatever you want to call it and ultimately got it going," coach Steve Kerr said. The Warriors had dropped three of four, including their worst defeat at home in Tuesday's 125-105 loss to the Thunder. Klay Thompson added 18 points, five rebounds and four assists on his 28th birthday. Durant dunked in transition on back-to-back possessions late in the second quarter, one off a steal he made, and Andre Iguodala also had a slam as the Warriors sent the game to halftime tied at 60. David West contributed 10 points, seven rebounds and seven assists in nearly 17 minutes for Golden State, which earned a 10th straight victory in the series. "We just had to provide some stability," West said. "That's what we've been talking about with the second unit." Green was fined $50,000 by the NBA for directing inappropriate and offensive language toward an official during the Oklahoma City loss. Green was ejected with 8:13 remaining after a second technical for arguing with the officials, specifically female referee Lauren Holtkamp. The NBA said the specific incident for which he was penalized occurred in the second quarter. On Thursday night, Green got hit with his 14th technical of the season -- two away from an automatic suspension -- in the second quarter for arguing after a delay of game warning. "I have no idea what will happen," Kerr said. "We know our whole team has been too emotional, too demonstrative. We're going to be under the microscope, we've got to be ready for that." Green will wear clear braces for a couple of weeks after his front right tooth was knocked back in a collision during Tuesday's loss. Mavericks: Dallas signed guard Kyle Collinsworth for the rest of the season. He previously had a pair of 10-day contracts. "I'm very happy to have him back," coach Rick Carlisle said. "He's done some very good things since he's been with us. He's earned this opportunity. So, I'm happy for him. And I'm sure all of our guys are." ... F Harrison Barnes missed facing his former team as he sat out a second straight game with a sprained left ankle. ... The Mavericks were swept 4-0 in the season series. Warriors: In the first, Curry passed Sacramento's Vince Carter (2,082) for sole possession of seventh place on the NBA's all-time list for made 3-pointers. ... Green became the 10th Warriors player in franchise history to reach 600 career steals. ... The Warriors avoided their first three-game skid since March 8-11 of last year when Durant was out with a left knee injury. ... Raiders WR Michael Crabtree sat courtside. Warriors: Host Spurs on Saturday. 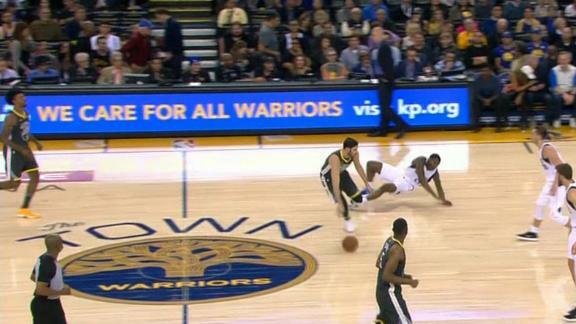 Omri Casspi dribbles up the court and uses a crossover move to drop Jalen Jones to floor.